So many brides ask about the cost of a veil. There are a a few things to consider when budgeting for your bridal veil. I hope to answer a few questions and open your mind to some things that perhaps you haven't thought of. After taking particular note of all of the things I had shared with her (right down to the measurements), she told me she had decided to make the veil herself. That consultation taught me so much. First, while we don't charge for a consultation that hour I spent with her wasn't free. It is the first cost that goes into the production of any bridal veil design. Second, there is so much value to the expertise I shared with her. I studied fashion design, I developed sewing and pattern techniques, and all of this takes time and experience. You may be surprised about the ending of this story! The bride returned five weeks before the wedding and told me she didn't realize how difficult it was to make a veil. On her wedding day, she walked down the aisle wearing my design! Katherine was working within a certain budget. Her desire was to find bridal accessories that potentially no one else had. She also wanted something that she assisted in curating. Annaliza benefited from her one-on-one collaboration. She expected to just go in, buy a veil, and be done with it! 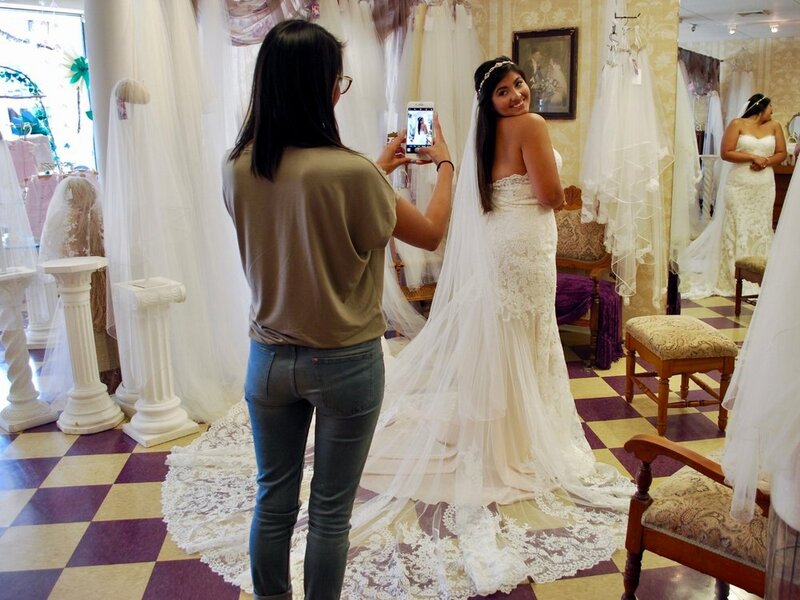 During her consultation I walked Annaliza and her parents through the process of designing a custom veil and what makes our designs so special. 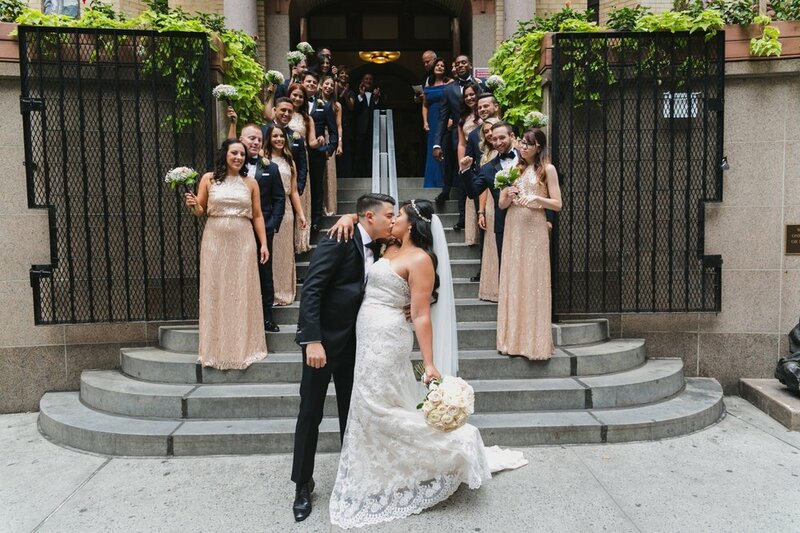 She said she never imagined the impact it would make for her on her wedding day. A blusher was something Annaliza had written off and never planned to think about again regardless of her parents request for one. It wasn't until her visit to Headpiece.com that she understood and saw how beautiful a blusher could be. When it came to her bridal veil, Lauryn didn't want to compromise. Lauryn went to several high-end bridal stores in NJ and NYC prior to finding Headpiece.com. She left each appointment disappointed with either quality, selection, or price. For years, I sold my European net veil collection to a very well known high-end department store in Short Hills, NJ. One day the manager of the bridal salon asked me if I could replicate a lace veil that a local high-end bridal veil designer made, but at a lower price. At the time, this veil was retailing for just under $3000. 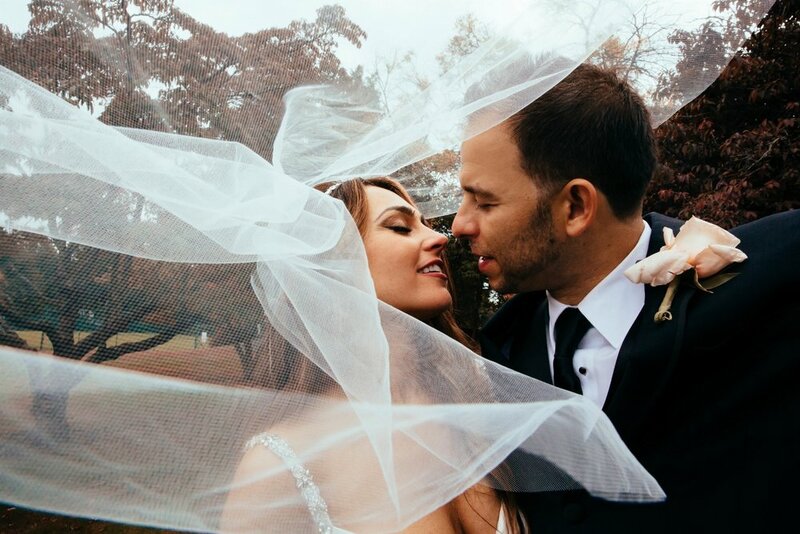 I carefully examined the veil and told them that I could design a similar bridal veil made from the most exquisite French laces and created with couture sewing techniques, but for the same price they were paying. The managers of the bridal salon had no idea the "couture lace veil" they were selling to brides wasn't couture at all! The lace was not French, and it was glued to the veil! Many of the vintage veils we work on were glued. Over the years the lace has become stiff, discolored, and the glue has turned orange. Glue is the "devil" in bridal veil design! A true designer utilizes a needle and a thread! One of our clients (whom we made a custom headpiece for) is soon to be married and brought her veil that she had purchased elsewhere with the hopes that we could help her to alter the volume at the comb. The gathering overwhelmed her head size, and the lace was so wide and stiff it stuck out at the sides. If the lace was stitched on, we could re-design it at the comb. The lace was 6" wide and not graduated towards the top of the veil. If we could remove the lace, we could cut it down and reposition it, but the lace on Sarina's veil appeared to be glued. We removed the comb and found that the gathering stitches were large and rolled causing thickness resulting in bulk. I was able to modify the stitching and do a little magic with the lace. Get a feel for the fabrication. If the netting or lace is coarse question the quality. Stitching is good! Glue is bad! If you plan to preserve your veil as an heirloom, be aware certain beading can't be professionally cleaned and steaming can damage the beading. Bulkiness at the comb is caused by a poor gathering stitch. Couture stitching techniques will not cause bulk. The gathering stitch should be consistent and look just as beautiful on the top of the comb as it does under the comb. You will recognize individually cut veils by their unique shape. Mass produced veils are cut in mass with limited shape. Mass produced veils come in a few standard lengths. A couture veil can be customized to any desired length---down to the inch. Lace does not have to be heavy! The best Alençon laces in the world will feel like they float off your body. Remember...anything created individually by hand will always add to your budget. Delicate shaping and luxurious fabrics make all the difference in the world! Our newest veil design "Betty" will stun guests as it romantically sweeps down the aisle. Deliberate lace placement is the sign of a couture veil. The lace on our "Hayworth" veil took hours to place and sew in an inner circle, with the tiniest lace pieces towards the center front of the veil and the larger pieces towards the center back. The stone finishing has a distinctive shine comprised of white opals and clear stone. Each stone is hand-placed. Nichole looked for a veil in several bridal salons and found she wasn't happy with the quality. Nichole found Headpiece.com through some of her bridal clients at J.C. Christophers, in Kinnelon, NJ, where she works as a stylist. 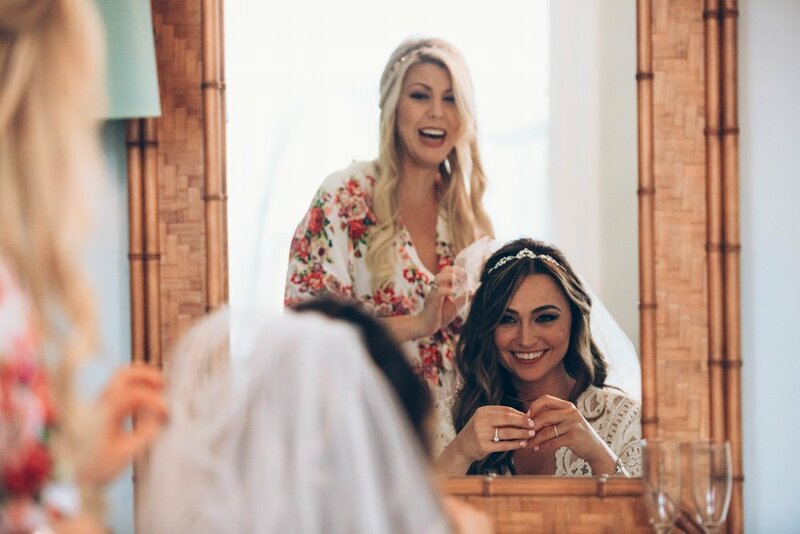 Nichole told us she will always remember her best friend placing the veil on her head as the final touch! Nichole wanted a specific amount of fullness at the crown of her head and a design that would be sheer enough to show the open back on her wedding gown. A great photographer can tell the difference between a couture veil and a standard stock veil. It has distinct movement, almost like it is alive and a real part of the wedding day. Photographer Amanda Bantham caught it all with her lens. A separate short reception veil was also on Nichole's wish list. Many store-bought veils that are shorter in length, fall full and stiff against the back bodice. Not at Headpiece.com! Our veils dance with you. All five of our brides had similar stories. All wanted a unique veil that was different and suited to their desired wedding day style. They also wanted to have a say in the details that were important to them. Headpiece.com designs are created individually to give each bride what they are looking for. So when you are on your search for your bridal veil, remember the stories of Katherine, Annaliza, Lauryn, Sarina, and Nichole. Let us know if we can help you along the way!